Aubergines are an excellent source of dietary fibre and Vitamins. Green bell pepper is a tasty vegetable, which is low in calories and contains 0 grams of fat and a good supply vitamins and minerals. Dry roast pumpkin seeds, flaxseeds, red chillies for 2-3 minutes on a medium flame. Place roasted peanuts, pumpkin seeds, flaxseeds, red chillies, cinnamon, clove, curry leaves, peppercorns in the food processor and ground to smooth powder. Bring water to boil in a pan, add rinsed quinoa, salt and cook on a high for 5minutes and then reduce the flame to medium and cook for 12-15 minutes or until water is absorbed. Heat oil in a skillet/pan and add diced onion saute for 2-3 minutes/until translucent. Now add diced aubergine, bell peppers and cook for 8-10 minutes/until they are tender. Add salt, ground masala powder mix well and cook for a minute. Now add cooked quinoa toss well until combined and let it simmer for 4-5 minutes/ until heated through. 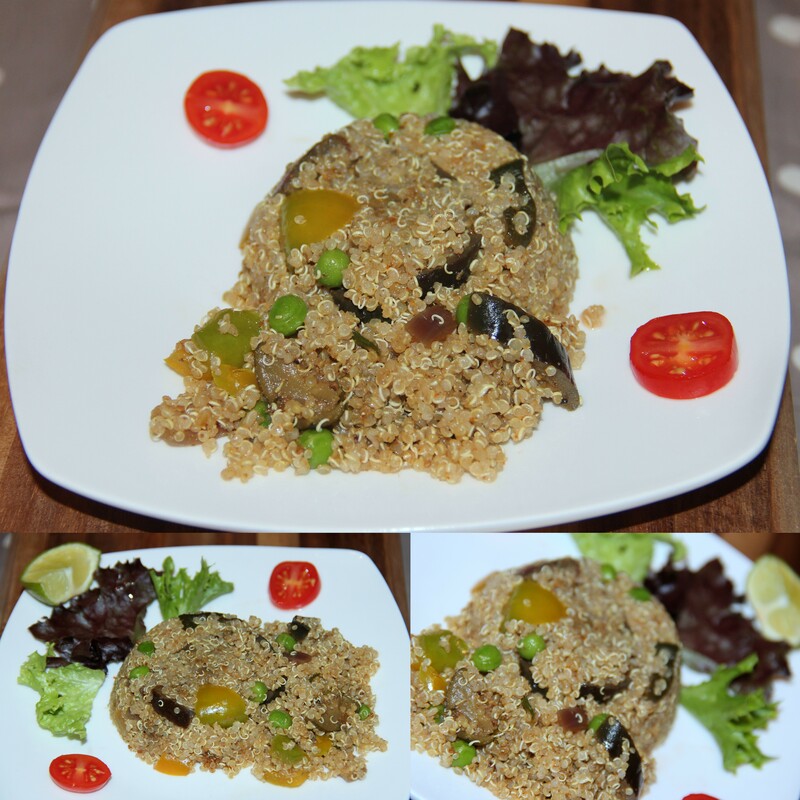 Posted on November 25, 2014, in Indian, International, Main Course, Main dish and tagged Chitras healthy kitchen, drchdietfood, Quinoa asian recipes. Bookmark the permalink. 15 Comments. A delicious and healthful one pot meal. Super food!! This recipe is going to be featured this week.